T here are plenty of green buzzwords around in gardening at the moment such as eco, sustainable and even ‘green’ itself, although how you can have non green gardening is a bit of a mystery! I am sure that all of us would like to live our lives in a way that protects our planet but does not require sitting in the dark and forgoing all modern comforts. Buzzwords rarely help us to make good decisions in the real world and so I like to look at my gardening choices in a simple and rather more practical way. Everything that we buy, be it paving, garden furniture, compost or plants, has a beginning, a middle and an end. By which I mean that everything is created by someone, used by us for a time and eventually disposed of. Each of these stages has an environmental impact in terms of resources, energy and transportation, and some are better than others. 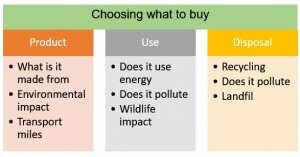 A moment’s thought about those impacts helps me to decide whether I want to buy a particular item or chose something different. For example, peat-based multipurpose compost has no adverse environmental impact while it is being used to grow plants and there are no issues with disposal, as it decomposes naturally into the soil, but there is a concern in the manufacturing process over the destruction of natural peat bog habitats. The earliest attempts at peat substitutes did not perform well enough to be widely accepted but recent developments mean that even commercial nurseries are now able to go peat-free and this makes it an easy decision for me too. Another area where each of us has to make a decision is over garden chemicals: particularly the environmental impact of their application and disposal. Careful use and appropriate timing can reduce the risk of harm to plants and wildlife that we value. Disposal of any excess is more of a problem to ensure that harmful chemicals do not end up in rivers. It is a case of weighing these impacts against the benefits and each person makes their own informed choice. This decision making process is quick, simple and applies to all my gardening purchases. Rather than resorting to buzzwords, I like to practice nature-friendly gardening and I make my choices accordingly.